By a / September 11, 2010 / . Top story on the newspaper’s front page. Call it “fanthropology”: the study of the culture and customs of sports team followers. And meet its most advanced civilization, the Steeler Nation. Black-and-gold fans aren’t content to express devotion with mere face-painting or hand-lettered signs. They create. They build. They glue. They sew. They make videos, customize furniture and reproduce likenesses of their heroes in papier-mache, silk-screen and tattoos. 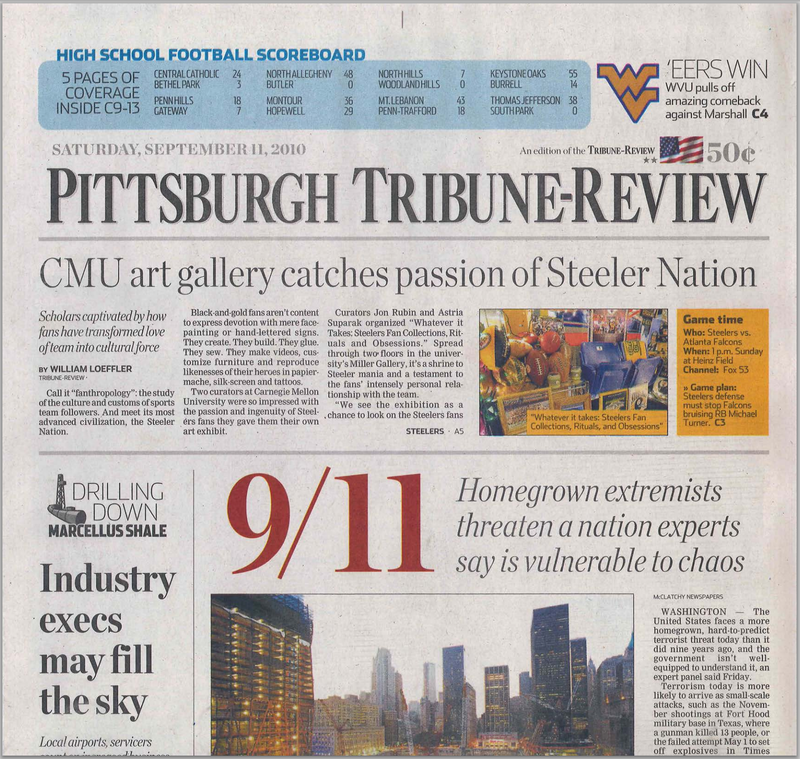 Two curators at Carnegie Mellon University were so impressed with the passion and ingenuity of Steelers fans they gave them their own art exhibit. Curators Jon Rubin and Astria Suparak organized “Whatever it Takes: Steelers Fan Collections, Rituals and Obsessions.” Spread through two floors in the university’s Miller Gallery, it’s a shrine to Steeler mania and a testament to the fans’ intensely personal relationship with the team. That identity has been exported around — and beyond — the world. A Skype hookup at the exhibit lets visitors speak via video screen to patrons at Botticella Birreria, a Steelers bar in Rome. A mash-up of fan videos includes one of Emsworth native and astronaut Michael Fincke giving a zero gravity shout-out to the Steelers from the International Space Station. A Terrible Towel hangs in the background. Visitors will find homemade costumes, crafts and customized T-shirts. A papier-mache statue of Troy Polamalu stands sentry in the elevator. A “hair helmet,” a shaggy headdress made by a local hair stylist, features a gold Mohawk and a black beard. Artist, critic and bon vivant Harry Schwalb is impressed with the way Steelers fans were inspired by their gridiron muse. A wall of photographs depict brawny biceps and sinewy backs tattooed with variations of the Steelers logo, as well as surpassing likenesses of late Steeler patriarch Art Rooney and Hall-of-Fame defenseman Joe Greene. Visitors can have their own tattoos photographed and added to the display. West Mifflin residents John and Shawna Evans and Rob Dalmasse built a scale model of Heinz Field. Denny DeLuca fashioned a chess set with figures that represent the starting lineup of the Steelers and Cardinals from Super Bowl XLIII. It’s one of hundreds of Steelers homemade art crammed into Denny’s Den, which is crowded with homemade Steelers memorabilia from his Carnegie home. DeLuca uses found materials to create much of his artwork. He’ll make miniature Steelers using plastic figures of baseball and basketball players. They don’t have helmets, so he makes them by cutting plastic grapes.